Mario Ortiz-Robles. 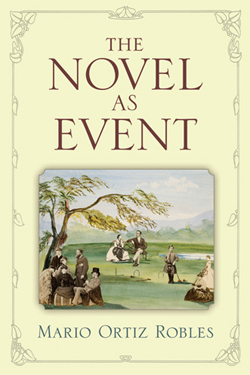 The Novel as Event. University of Michigan Press, 2010. The Novel as Event is a timely reconsideration of the historical role of the Victorian novel from the perspective of its performativity. In a highly original application of the work of Jacques Derrida, Paul de Man, Pierre Bourdieu, Judith Butler, and other readers of J. L. Austin, Mario Ortiz Robles argues that the language of the novel is paramount and that the current emphasis on the representational and physical aspects of the novel tends to obscure this fact. He provides brilliant original readings of five major Victorian novels: Dickens’s Our Mutual Friend, Brontë’s Jane Eyre, George Eliot’s Middlemarch, Thackeray’s Vanity Fair, and Collins’s The Woman in White, illustrating that it is impossible to fully grasp the cultural power of the novel, from its role in the cultivation of manners and the conduct of courtship to the consolidation of bourgeois ideology and the construction of the subject, without an adequate account of the performativity of its language. By considering the novel as a linguistic event, Ortiz Robles offers a new explanatory model for understanding how novels intervene materially in the reality they describe, and, in doing so, he seeks to reinvigorate critical debate on the historicity of the realist novel and current methods of cultural criticism. The Novel as Event serves as a well-timed corrective to the narrow historicist approach to the materiality of the novel that currently holds sway.